We all need one. After this last month, I definitely need one. So while I recharge, posts will be on hold. If you got some time to kill, check out the archives, and hopefully, when I get back, I'll be filled with inspirations, of the visual and intellectual kind. I should have paid more attention. After all, I made it to every mechanical systems class, despite its 8:30 am start time. And though I sailed through, it was more because our professor was a softie, than that I really absorbed the material. After this week, I definitely wish that wasn’t the case. The minutia of the technical components inherent in the creation of one project is often glossed over in school. There are a number of reasons why this happens. Some argue that there just isn’t enough time in the architecture curriculum for in depth study of these aspects, which other professionals spend significant amounts of time studying. Some say that these fundamentals are better learned on the job, when real world constraints provide lessons in compromise and efficiency. Still, in my own humble opinion, I think it would be in an architect’s best interest to take a keen interest in the things that, as students, we considered mundane and rather superfluous. The problem that arises from this predicament, in my particular case, is the reliance on others to complete necessary work for your client. The right consultants make this part an engaging process, as you learn how other disciplines react to the challenges of the project. The things that worry them don’t necessarily bother you, and vis versa. They worry about airflows, efficiency ratios. You worry about how they’ve crossed your space in odd locations with their exposed ductwork and conduit. They remind you to think about wattage loads and noise levels. You remind them that you can’t have an 18” duct in a space with only 7’-3” clearance. In the best relationships, this back and forth progresses towards a positive resolution. Through some compromise, a bit of back and forth, a solution is finally reach that incorporates their knowledge of those finite details you might not know with your design intent, which they might not have ever imagined. The problem with an interdependent relationship, however, is the potential pitfalls that arise then one partner falters. Or ignores you. Or misses deadlines. Or fails to ask you questions until they realize that, yes, they need to provide you with the things you have been requesting because, no, your request were not for fun. These situations make me realize how little I know and how much our profession relies on the professions of others. I never wanted to be in the position where I felt so beholden to others. It is an impotent feeling, and frustrating to no end, because, while your project is the most important thing to you, it might not be the case to your consultant. My consultant made me understand that quite perfectly. It’s a tricky game, once the relationship goes south. Deep down you want to scream, shout, demand that their obligations be met. You practice diplomacy, hoping that their professionalism will prompt them to keep their new promises, their agreements to new deadlines. But as they fail time and time again, you lose hope, and think, what happens now? You still need them to complete, or else you’ll really be screwed. You hang on, and think, once this project is over, you’ll never hear from me again. A dream scenario might be the one practiced by large firms, with architects, engineers and the lot all housed in one place. Coordination would be a lot easier, one imagines, and consultants could be a part of the team from the get go. I imagine team meetings, where people from the different departments pow-wow, discussing great new ways to address the delivery of cooled air to their quirky designed spaces. Trace is used by the roll, and red ink flies, as the architects and engineers throw ideas back and forth, asking each other for more, better. And then, with a solution finally reached, they pat each other on the backs and pop open a few beers. Fade out. Another scenario might be to become the expert. More school, more debt, but hey, you learn how to do it all. Screw the consultants, control it all yourself. That might be wonderful as well. Decisions made immediately, no need to wait. You get to decide where things go, what things take priority, and detail it all. Coordination would be a breeze, and things would all go swimmingly. Unless there was a mistake, in which case, you’d get to assume liability for it all. End scene. I am not sure what might be the best way. As of now, I have only been exposed to this way. And this way isn’t working. So, hopefully, in my future, new relationships will present themselves, and perhaps I’ll find that perfect one. The one that works, that gets me what I need, when I need it. The one that challenges me, matures me, and teaches me. But, until then, I am at least committed to finding my damn mechanical systems textbook and hauling it into the office. At least that seems to be the running theme when it comes to all things Dubai. Just take a look at the craziness coming from the minds of OMA. A city, rising from the sands of the desert. With the Deathstar as a center piece. The sheer size of the development boggles the mind. I mean, six and half square miles, built from scratch? And, given the rate things are going out there, probably done within the next 5 years? Le Corbusier could only dream of such things when he was drawing his radiant city. Mr. Ouroussoff's opinion is an cautiously optimistic one, seeing success in even its failure. But his assessment assumes a fact that I am not sure I agree with: that if they built it, they will come. Not that the money pouring into the region will draw a significant population. But to fill all this? Mr. Ouroussoff's concern is that the communities will turn into gated enclaves of the super-rich. But, what about the other, quite possible, outcome? A ghost town of the few, fighting against the unrelenting sands? Are there really enough people migrating to Dubai to fill all that is being built, and planned to be built? I can't fathom what exodus these planners imagine causing the migration. Perhaps the thousands of bankers finding Wall street unwelcoming will make there way there. Even then, that would fill, what, one or two of the mega skyscraper residences being built. And, unless they plan to give away flats for free, I'm guessing the developments currently underway are not going to be filled by the workers brought in to build them. As an exercise in design, this project would be a wonderous opportunity for any firm. The magnitude of this project allows for the investigation of ideas through number of scales, considering the complex connections that define a modern urban experience. But, the reality? One can only do so much before the economics take over. And even the richest developer has a budget. But, well, hey, I might be wrong. Dubai is a place of fantasy, a world quite literally unto itself. It is the playground of starchitects, where whimsy and imagination have free reign. It is perhaps a dream coming true. Maybe that's why seeing the Death Star floating on a man-made island makes so much sense. 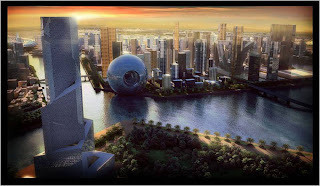 Dubai is a fictional world brought to life, a sci-fi movie set for an imagined life that, somehow, became real.